← Fan Girl Friday: Five Fictional Places I’d Never Want to Live. Monday: A Bit of Travel Poetry. Well guys, we’re down to the wire. Six days until take off. 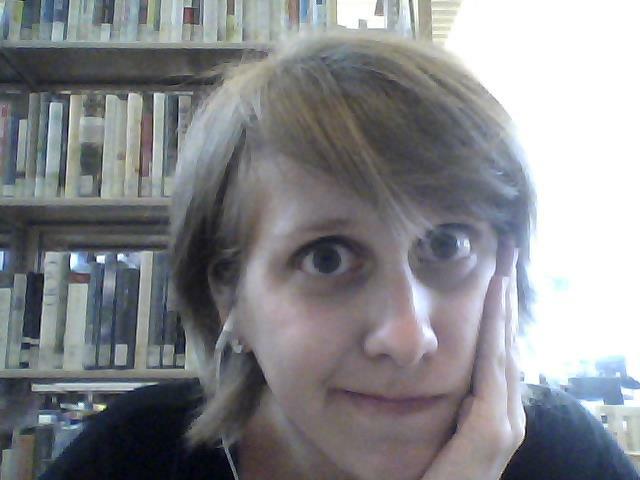 Subtly taking pictures of myself in the Woodstock library. Classy. Today I initially planned on writing about why I chose to travel to New Zealand for a year, until I realized that I had pretty much covered that in my entry last Wednesday. Whoops. Got a bit ahead of myself there. I then contemplated writing about the process of getting ready for New Zealand, or maybe what I’ve been up to since I got back to Portland. None of that really seemed interesting to me though. Oh being back in Portland has been fun, what with LeakyCon and garage sales and catching up with friends, but I figured it’s not of much interest to anyone but myself. As for prepping for this trip, well, I might write something along those lines later on, but I’ll probably wait until I’ve actually done a bit of traveling first. I also don’t really have anything of interest to contemplatively write about today. I’m actually pretty brain dead at the moment. I just emailed my college adviser the final draft of my Theatre Arts capstone, ie. the last college paper I ever have to write. While I’m overjoyed, I am also exhausted. I’d take an impromptu nap right now except, y’know, doing so in a public library filled with children probably wouldn’t be the best idea. So instead, I thought I might share some poetry. This is a series of poems I’ve been working on since the start of the year. The title of each poem represents how many more months I have left to go until I leave for New Zealand. Each one reflects what was happening in my life during the time I wrote it, as well as what was going on in my mind in relation to this upcoming trip. They’re not my best work, but I still like how most of them turned out. I hope you do as well. I realize poetry isn’t the most interesting thing to share on a blog mostly dedicated to travels, but writing poetry has become such a big part of my life over the last couple years that it was bound to happen at some point anyway. Might as well make it now. and it is impossible to call them back. The regions roll off my tongue. the land of the Auck. and in a land so new to me. My worry stems from guilt. Going out with Portland pals. Bonding with baby half cousins. Adventures to NYC to meet TPers. for lack of family and lack of country. walking around Pioneer deep in search. A year I should be spending with my father. A year I should be bonding with my brother. A year I should be reuniting with my family. I could be doing with my year. Please let this be worth it. to walk on the soil to which I call home? will I even want to come back?